If you want to talk about Drew Leszczynski's outstanding sophomore season, you better chat with his big brother Nick. Drew lets his actions speak louder than words - much louder. 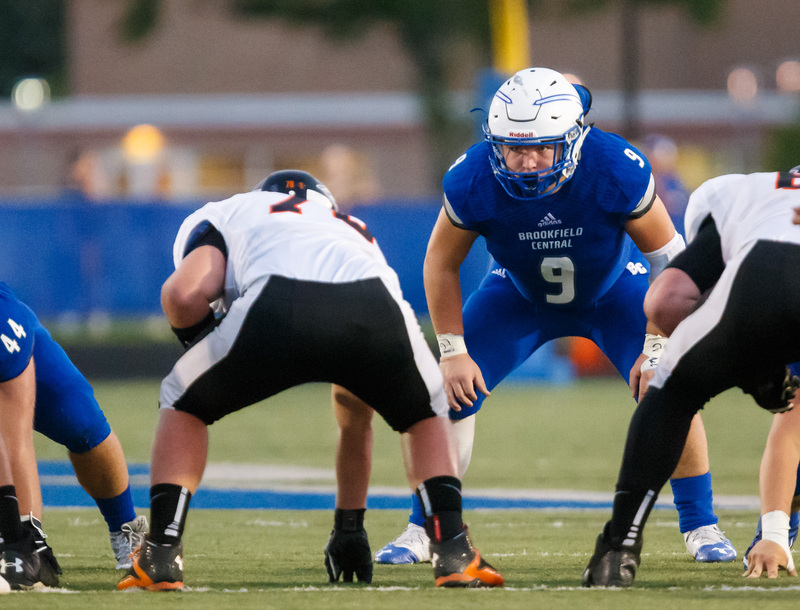 Last season, Drew started on the varsity at quarterback and led the Lancers to a share of the Greater Metro Conference Championship with a 6-1 mark and a 10-2 overall record - as a sophomore. He completed 82-of-132 passes, 62.1 per cent, for 1406 yards and 15 touchdowns, averaging almost 128 passing yards per game. He also ran for 539 yards in 100 carries (5.4 average), 3 touchdowns and caught 4 passes for 45 yards and a score. That's a combined total of 1,990 yards and 19 touchdowns. 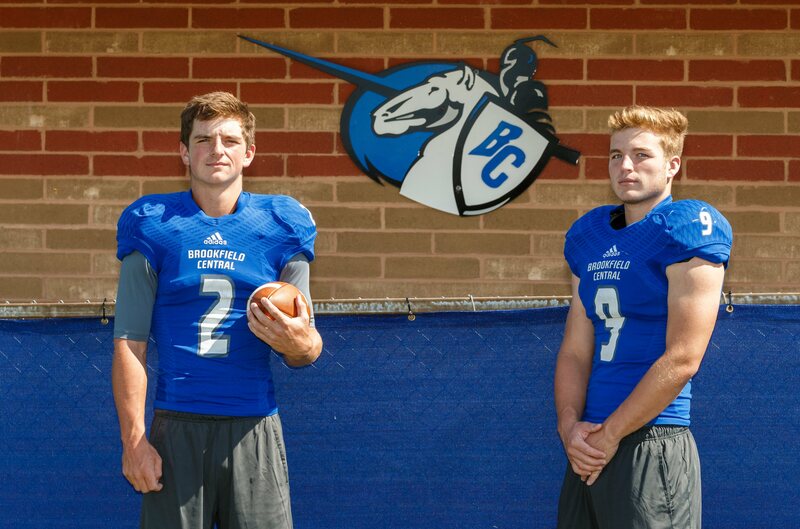 As a result he was named first-team All-Greater Metro Conference as one of 4 quarterbacks, the other 3 being seniors. "I've been watching him play as long as I can remember," Nick said. "And I know under pressure, Drew is at his highest level - even if it might not seem like it when you're talking to him. You don't know how confident he is in his own mind. I know he will get the job done. He's been able to show his best with the best as long as I can remember." Photo by Alan Herzberg, SportsPhotos LLC --- Last year was the first time Drew and Nick Leszczynsky played on the same team together. Nick was thrilled with playing with his brother for the first time last season. "I think it's awesome," he said. "We played baseball or we played pick up games on the basketball court outside. We've always been competitive. That's how our relationship has grown a lot. Football, being able to play with him - this is the highest level we've ever got to play together - so it's really cool to see him do well and help our team out a lot because I know what kind of athlete he is and he's always been." When Drew was asked what he likes best about playing quarterback, some of that confidence came through. "I like being in control," he said quickly. When asked what parts of being a quarterback he liked, he covered all the bases. "I like passing. I like running too. I like both," he said. "I like football because you can really show off all your skills. You have to pass, you have to run, you have to be smart." When asked what was it like winning the conference his first year, Drew responded. "I didn’t know what to expect honestly," he said. "So it was awesome that we could win the conference." Brookfield Central's head man, Jed Kennedy, who was GMC co-coach of the Year last season and Coach of the Year in 2015, watched Drew play in the Jr. Lancers program. "I saw him as an 8th grader and he was a heck of an athlete," he said. "Looking down the road I could see he was the next guy who was going to be really, really good." Did his play last season surprise Kennedy at all. "He didn't surprise me," he said of Drew. "He was doing it long enough. Bottom line is this - some kids get it and some don’t. He's a kid that gets it. "The big thing is he throws unbelievably hard. He throws a baseball 90 mph. His athleticism is great. It was hard as a sophomore, but now that he's starting to understand the reads. The sky's the limit for him." 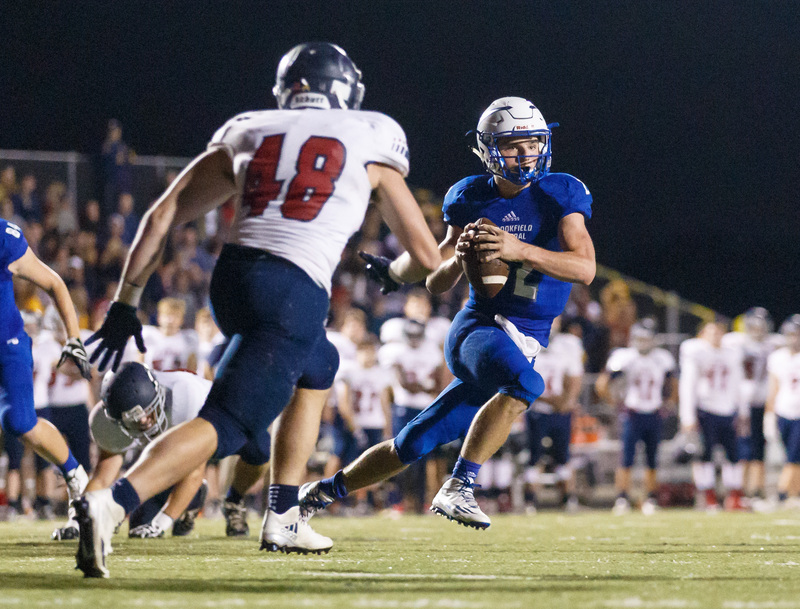 Photo by Alan Herzberg, SportsPhotos LLC - Drew was named first-team All-Greater Metro Conference as a sophomore at quarterback. Photo by Alan Herzberg, SportsPhotos LLC - Nick (9) is looking to earn All-Greater Metro Conferences for the third year in a row. Big brother Nick, who also wrestles, plays baseball and Lacrosse, has been a key part of the Lancers on the other side of the ball since his sophomore year. He will be shooting to make All-Greater Metro Conference for the third year in a row, earning honorable mention as a sophomore and first team last season. More importantly, he will be shooting to win his third straight conference championship. "It was awesome my sophomore year, playing that first complete game was just a change of pace from what I was used to," he said. "I like being tested and being put to a challenge. Playing in the GMC there are a lot of good players, a lot of solid teams. Winning two years in a row was sweet for me." Nick had 52 tackles, 16 solo tackles, 7 tackles for losses and an interception as a sophomore at inside linebacker. Last year he had 60 total tackles, 14 solo tackles, 9 tackles for losses, 2 fumbles recovered, 3 forced fumbles and 2 interceptions. "When I saw him as a freshman the first time, he was a physically old school player," Kennedy said. "He would play downhill, run through the runner. He is an unbelievable clean and tackle linebacker, who is smart and gets the game." Nick mirrors his coaches thought on his play when asked about what he likes about playing linebacker. "You have the chance to make every single tackle," he said. "You have a chance to change the game every single play. You have a chance to lead the team. You call plays (Nick gets the defensive call from the defensive coach). You know what the cornerbacks are doing and you know what the D-linemen are doing. It puts me in a position where I can help everybody out." So it was no surprise when he was asked about his strengths. "Football IQ," he said. "I'm always leading, knowing what to do and where to be." Being a senior, Kennedy talked about what kind of leader Nick is. "He's a vocal leader, high energy, one of our captains," he said. "Guys are looking to him to lead. The past two years he has been huge; one of our best players." Nick enjoys leadership, but he credited all the seniors with being good leaders. "It's always something I like to do, but it's knowing when to lead and how to lead," he said. "We have a lot of leaders on the team, so I would never put myself above any of them. It has to come out in a good way when you're saying something to somebody, not putting them down, knowing what to say. "It's very important to me. I can't do my job if I can't make sure everyone is doing their job. But there is not one leader out there, there's nine of us." Having a year under his belt and playing perhaps the key position, Drew also has picked up his role as a leader. "It's important. Last year was the first year I really started to become a leader because I set the stuff up for the team basically," he said. "This year I help them too - even more. I think they look up to me." Nick chipped in and talked about his younger brother's leadership skills. "You won't see him saying things in the locker room, you won't see him saying things in the film sessions. It's basically a lot of 'in the moment' type of stuff where he knows he has to be confident for the team and help the team out. He knew when to speak as a sophomore." So the Leszczynski boys will have one more year of playing with each other. They are both looking forward to it. When Drew was asked what was it like lining up against his brother in practice, he laughed. Just like a big brother would. WHAT DO YOU WANT TO DO IN THE FUTURE: Attend college, study business and play football.